Sikiru Adepoju is a legendary talking drummer from Eruwa in Oyo State Nigeria. He is descended from a long line of drummers and his father began teaching him how to play the drums when he was six years old. He and his brothers played in the family band. He later became a member of Chief Commander Ebenezer Obey’s Inter-Reformers Band when he was a teenager and this was when he became famous in Nigeria. He travelled to the United States in 1985 in order to play with afrobeat legend Orlando Julius and master drummer Babatunde Olatunji. Olatunji had been famous and very influential in the music scene in the United States since the early 1960s and he introduced Sikiru Adepoju to his friends, including Micky Hart. Musician, musicologist and drummer for the Grateful Dead, Mickey Hart had an idea to make an album in which all the best drummers from around the world would feature. The album featured Mickey Hart (United States), Zakir Hussain and T.H. “Vikku” Vinayakram (both from India), Babatunde Olatunji and Sikiru Adepoju (from Nigeria), Airto Moreira and his wife Flora Purim (from Brazil) and Giovanni Hidalgo and Frank Colon from Puerto Rico. The album won the first ever Grammy Award in the “World Music Album” category at the 1992 Grammy Award ceremony. It also reached number 1 on the Billboard chart for Top World Music Albums. Unfortunately Babatunde Olatunji died in 2003. Sikiru Adepoju has collaborated with many musicians including Stevie Wonder, Babatunde Olatunji, Carlos Santana, Ebenezer Obey, Airto Moreira, Bimbo Abimbola, Mickey Hart, Orlando Julius, Muruga Booker and The String Cheese Incident. Sikiru Adepoju continued to collaborate with Micky Hart on many projects after the death of Babatunde Olatunji. One of those projects was the Global Drum Project which won the 2009 Grammy Award for Best Contemporary World Music Album. It also reached number six on the Billboard chart for top world music albums. 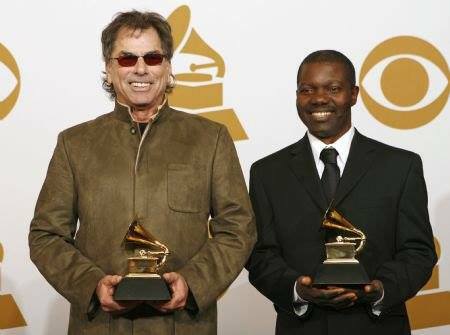 The album featured Mickey Hart, Zakir Hussain, Sikiru Adepoju, and Giovanni Hidalgo.